Stat of the day: $150. The cost of buying the first TV fitted with Eugene Polley's invention, the remote control. 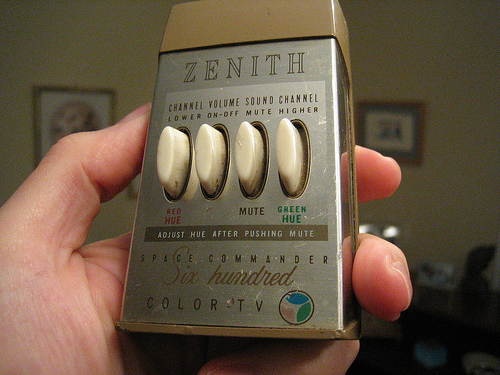 When the $150 Zenith Flash-Matic product first came to market in 1955, it was the victim of some early functionality issues, as it worked by shining a beam of light onto the television’s photo-sensors that would then relay the channel-changing instruction. But when the sun shone, many customers would complain that the sunlight would change the channel or even switch the TV on and off. Arguably responsible for creating hundreds of millions of couch potatoes, the remote control was a major milestone in the development of home entertainment. The idea that you could control multiple channels without moving from your seat no doubt gave rise to the idea of having hundred of channels (most of them dull) that we can enjoy today. Polley held 18 patents for his various inventions.